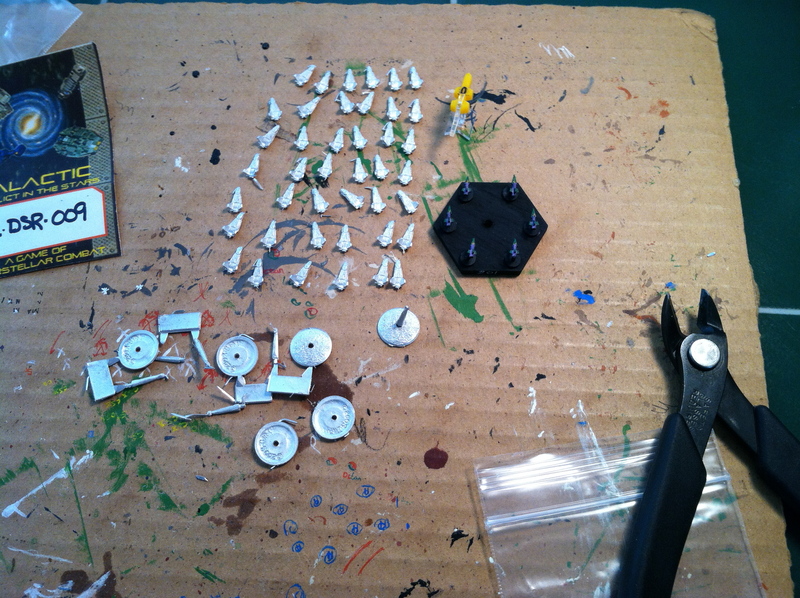 Spaceship casters will sometimes produce a line of miniatures that consist solely of a fleet’s warships, and not bother with the fighters. I’ve got a few fleets like that — plus a couple of discontinued fleets that I now can’t get the fighters for. Rather than augment these fleets with X-Wings and Vipers, I went looking for somebody who sells fighters without spaceships. Enter Iron Wind Metals. Iron Wind has a couple of properties that they produce micro-scale fighters for: Galactic Conflict in the Stars, and BattleTech. While the first line does come with ships, their fleets are incomplete for my purposes, so I have no qualm stripping out the fighters for my under-equipped fleets. 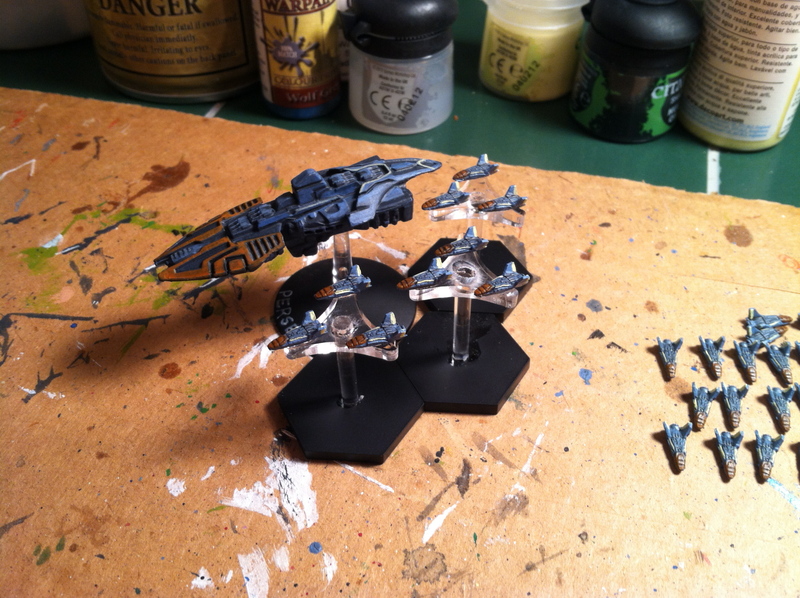 In this case, it’s Iron Wind’s Earendel fighters for Ravenstar’s Terran Republic Navy. 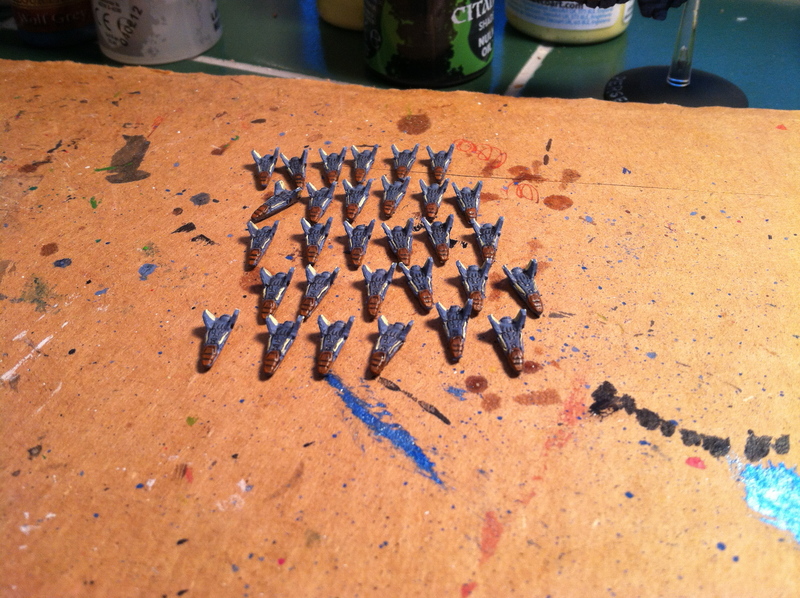 The other metal objects in the picture are the bases packaged with the Earendel. I won’t be using them, but I figured it was worth including them in the shot, as Iron Wind’s store has a picture of their models mounted on their six-fighter bases. The fighters after being primed. 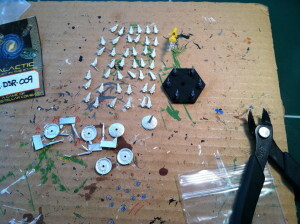 The first step in painting is, of course, the priming. There’s actually a bunch of detail on these models, and I didn’t want to lose that with too-thick prime. 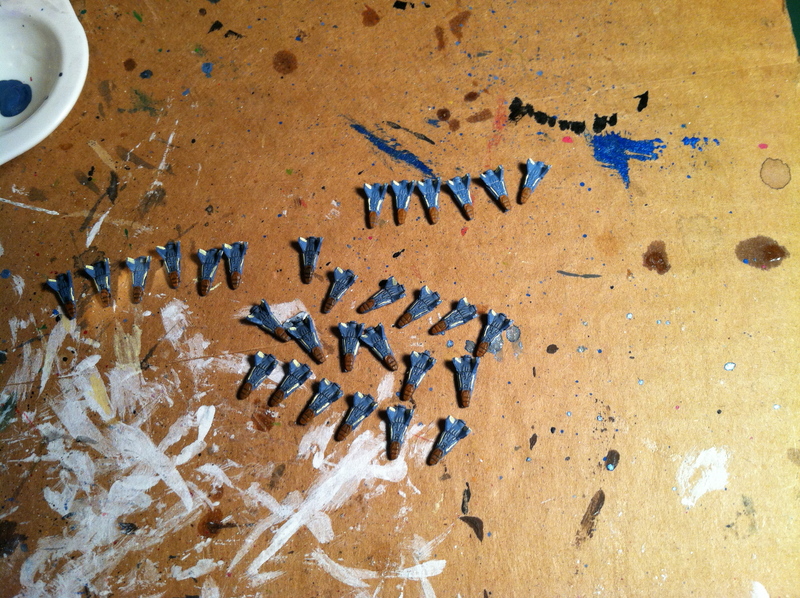 I broke out Army Painter’s Wolf Grey for the job, for a couple of reasons. The biggest is that I’m lazy, and this skips the base-coat step. The other is that it reduces the number of coats of paint, so keeps the details sharp. 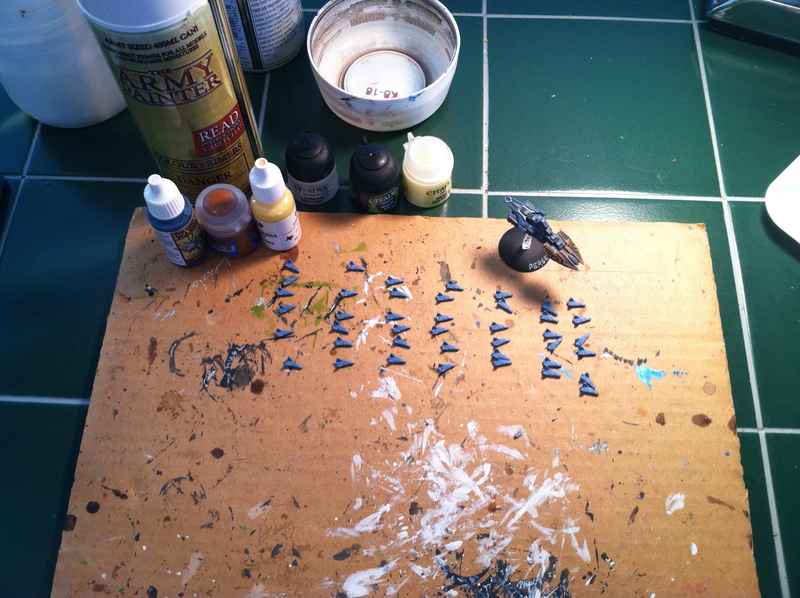 Normally, I keep notes on my fleet so that I know exactly which paints I used, but I painted the Terrans far enough in the past that I had neither notes nor paint. 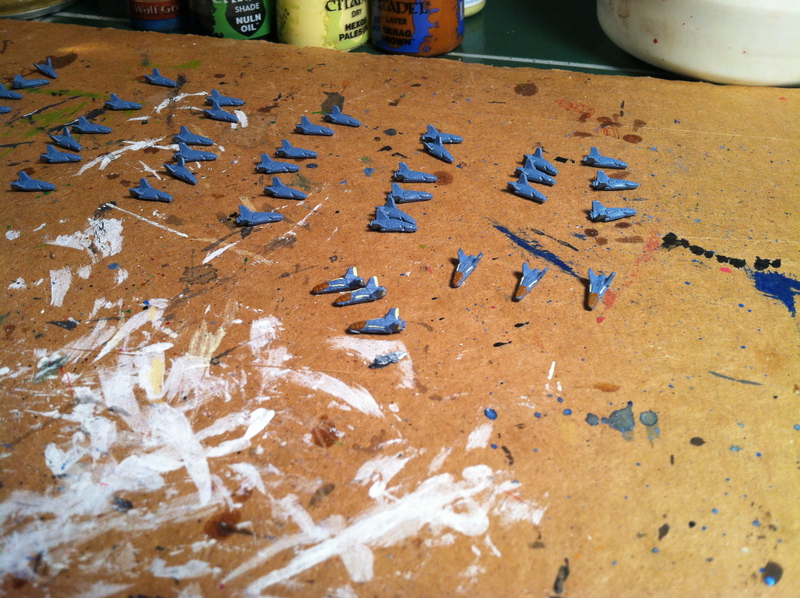 The Wolf Grey went well enough with whatever Vallejo paint I used on the Terrans, but I needed to find replacements for the other two colors. In the end, I went with Citadel/GW’s Skrag Brown and Americana’s Pineapple. For those of you who aren’t familiar with the line: Americana is a line of craft paints produced by DecoArt. I prefer minis paints because craft paints tend to be thick and dry very fast. Their advantage is that they cover in one coat and come in colors that are otherwise hard to find on short notice. Showing the effects of the first wash. The next step was to add a wash to make the details pop. 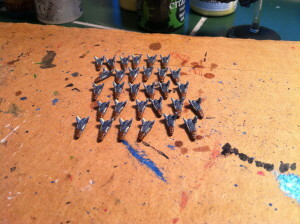 As usual, I used a combination of Citadel’s Nuln Oil and their Lamia Medium. The difference this time is that I couldn’t clean up the extra wash on a mini this small, so went with a one-to-two ratio. This avoided darkening the mini too much, at the price of needing two coats of the wash.
It’s worth clicking on this picture to see the detail. If I wasn’t trying to make the color scheme match the original fleet, I could have been tempted to paint the individual widgets. Here are some fighters mounted on Litko’s flight stands. I went with the three-prong peg topper, and sprayed the base with GW’s black primer so that I could tag them with squadron numbers. Note that I forgot my own advice and used cyanocrylate on the first stand, and it frosted right up. 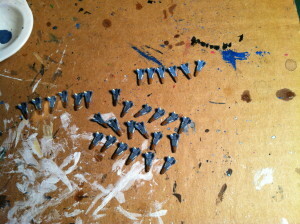 After cursing myself, I put the CA away and used the Testors clear plastic cement on the rest of them. You can tell the difference clearly in this picture. I was worried that the “plastic cement” wouldn’t bond acrylic and pewter, but it works just fine. On the whole, I was very pleased with the fighters. They were well-cast, with unexpected detail, and only required the barest of trimming to remove vent flash. There were tiny imperfections on the engine exhausts, or I’d be rating these 5/5. 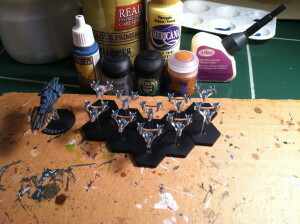 As it is, they’re 4/5 and I’ll be ordering more from Iron Wind to fill out my other fleets. This entry was posted in third party and tagged iron wind metals, workbench. Bookmark the permalink. Very nice review, I appreciate it ! The Earendel’s are for the Galactic universes German based faction, but it is really good to see them being used elsewhere.